The JBJ self contained Nano Cube offers the easiest solution for the hobbyist that demands high-tech performance in a miniature habitat for their aquarium fish and corals. The elegant Nano Cube offers panoramic viewing with smooth rounded glass corners with the necessary filtration, lighting, and circulation for a thriving mini-reef or freshwater aquarium. 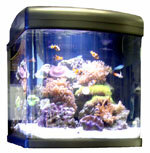 Just what you need besides the fish, corals, plants, and a live rock if you need it started with your Nanocube.